To provide formal banking services to people belonging to the weaker section of the society in urban & rural areas. To promote habit of saving money, making insurances and pension investment among poor people. To help poor people get loans at cheap rates from normal banks to prevent them from becoming victims in the hands of local moneylender. BSBDA (Basic Savings Bank Deposit Account). LBS (Lead Bank Scheme) was introduced in 1969. It envisages assignment of lead roles to individual banks (both in public sector & private sector) for the districts allotted to them. A bank which has a large network of branches in the rural areas of a given district and is endowed with adequate financial and manpower resources is generally entrusted with the lead responsibility for that district. In this way all the districts in the country have been allotted to various banks. No Frills account is a basic banking account which requires no minimum balance or very low minimum balance. Charges applicable to such accounts are low. The RBI directed banks in India to design a no frills account a, low ‘minimum balance maintenance’ account without any conditions and with simplified KYC (Know Your Customer) norms in 2005. But all the existing ‘No-frills’ accounts opened were converted into BSBDA in compliance with the guidelines issued by RBI in 2012. This account does not require any minimum balance. The services available in the account will include: deposit and withdrawal of cash at bank branch as well as ATMs. Receipt or the credit of money through electronic payment channels or by means of deposit or collection of cheques drawn by Central/State Government agencies and departments. 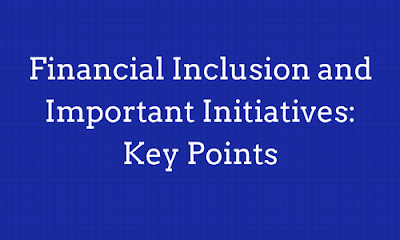 RBI has set up a committee with the aim of creating a five-year measurable action plan for financial inclusion. It include take a look the existing policy of financial inclusion, including supportive payment system and customer protection framework and also taking into account the recommendations made by various committees set up earlier.